One of my most enjoyable commissions so far. 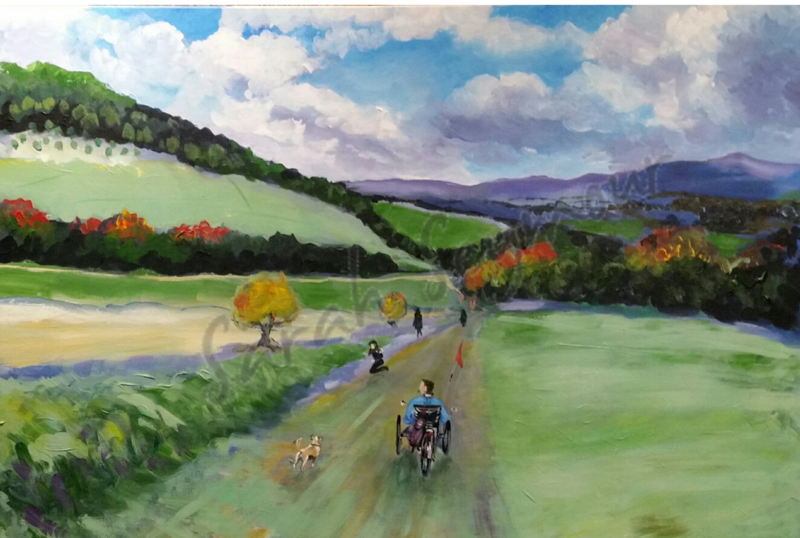 A family of 5 requested a large painting of a Chilterns landscape, with them in it, for their living room wall. They supplied a photo of the scene, but as it was taken on a dull, grey day, the colours were very muted. The brief was to jazz up the colours and give it an autumnal feel. I also had to add the whole family plus dog! The wall it was destined for was painted a bold ‘heritage’ red, so the canvas had to work both in terms of colour and dimensions. Discussing the size with the family took some time, but we eventually settled on a large 90 x 60cm box canvas. I took a bold approach with the colours (possibly inspired by the dynamism and energy of my clients as well as the wall hue). I added a windblown sky, full of light and shadow, and simplified the shapes of fields and trees, creating them out of large blocks of intense colour. Dark shadow tones were employed to add depth and drama. If you too have a favourite place, why not ask me to do a personalised picture of it for your house?